It has been an interesting start to the year for the capital markets. 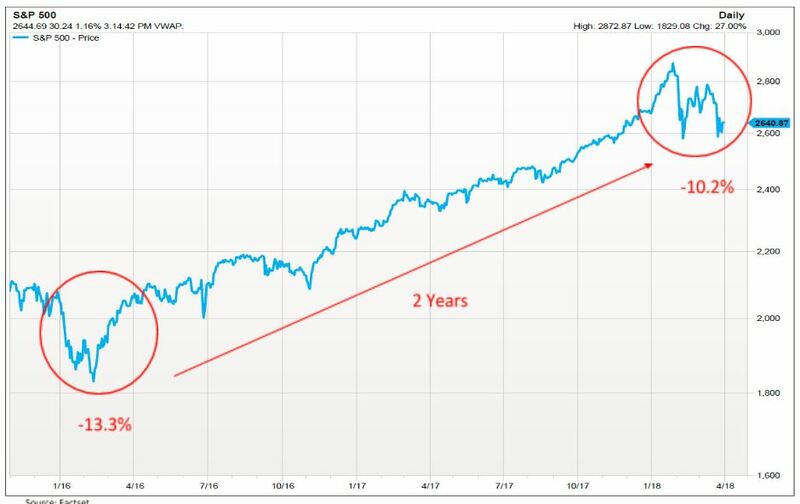 The equity markets have felt overly volatile and we saw our first correction in the S&P 500 (Decline of 10% or more) in over 2 years. This correction felt uncomfortable and for good reason. Coming out of 2017 which was a docile year in terms of volatility, many investors may have been lulled to sleep while forgetting how volatile the equity markets can be. To put this in perspective consider the following. every 12 months. It had been over 2 years since the last correction. years without a 5% decline prior to the most recent correction. Adding to the discomfort was that this decline was accompanied by some violent trading sessions. Media outlets need something to latch onto to drive ratings and a 1000+ point decline in the Dow Jones Industrial Average is one they simply cannot resist. Chances are, when you tuned in or logged on to your news outlet of choice, you saw this headline flashing across the screen in red. While this correction did feel uncomfortable, I think we all felt a correction was overdue and a variety of catalysts could help trigger the downward momentum. Let’s take a look at what we believe were some of the main catalysts causing uncertainty driving the elevated volatility levels and ultimately the correction. The unemployment rate has moved down close to 4%, creating competition for workers which helps drive up wages. Higher wages means more money in the hands of the consumer, which usually means they’ll spend it, pushing the prices of goods and services higher. If inflation starts to tick up faster than the Fed wants, they could raise short term rates faster than the market anticipates trying avoid an overheating economy. The Fed has been fairly transparent with their rate hiking plan to this point, signaling for 3 rate increases in 2018, however some anticipate 4 rate hikes in 2018 with Jerome Powell as the Fed Chief, time will tell. Many of us are in the camp that the bond bull market has come to an end. Higher interest rates can put downward pressure on stock prices, especially high dividend paying stocks as investors move away in favor of what they believe are “less risky” fixed income investments. Coming into 2018, we had a sustained period of rising interest rates followed by a 35 year period of declining interest rates. 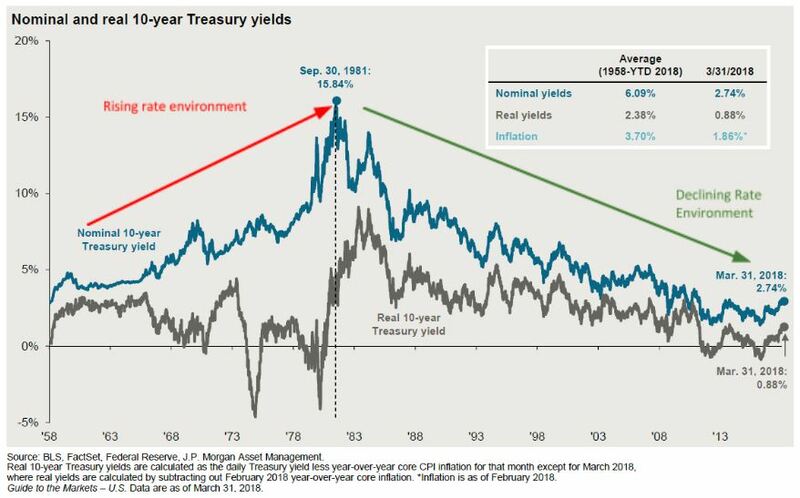 The last 35 year period of a declining interest rates, which caused bond prices to rise, provided smoother sailing for “conservative” fixed income investors that wanted lower risk investments which provided a reasonable level of return. In the current environment, interest rates are starting to tick up and as they do, bond prices will fall. Most fixed income investors are not used to their “safe investment” losing value but as we potentially enter a period of sustained rising interest rates, the fixed income environment is becoming a more challenging area to navigate. With this in mind, you will see us using shorter duration and alternative fixed income investments where it makes sense in your portfolio with the goal of defending against the rising interest rate environment. Unfortunately, political uncertainty isn’t anything we can avoid and is usually present in some form. Political uncertainties weighing on investor minds include the nuclear threat from North Korea, potential trade wars with China and the midterm elections looming this fall. While we cannot control these events, investors are uncertain of the outcome and markets do not like uncertainty, which helps contribute to the short term volatility we have experienced recently. So, after all of the uncertainty and recent volatility where did the markets end the first quarter of 2018? Equity markets were mixed with the tech sector surprisingly becoming a safe haven of sorts which helped drive the NASDAQ to a positive return for the quarter. Not what you would normally think in a volatile market environment. The fixed income market returns reflected rising interest rates showing negative returns across the major indices shown here. The road was bumpy but using the S&P 500 as an example, we pretty much ended where we started. As we approach the later innings of this market cycle, the road to higher returns continues to look bumpy due to short term volatility. Moving forward, we feel it appropriate to take a longer term approach to investing, reducing the short term market fluctuations to noise. Looking beyond the noise allows us to focus on the fundamentals that we feel will drive future market returns. Earnings growth – With the passing of the new tax bill, earnings are projected to grow around 18% over the next year and this is a positive for the US equity markets as company earnings are a primary driver of equity returns. Increased earnings normally leads to increased company value. 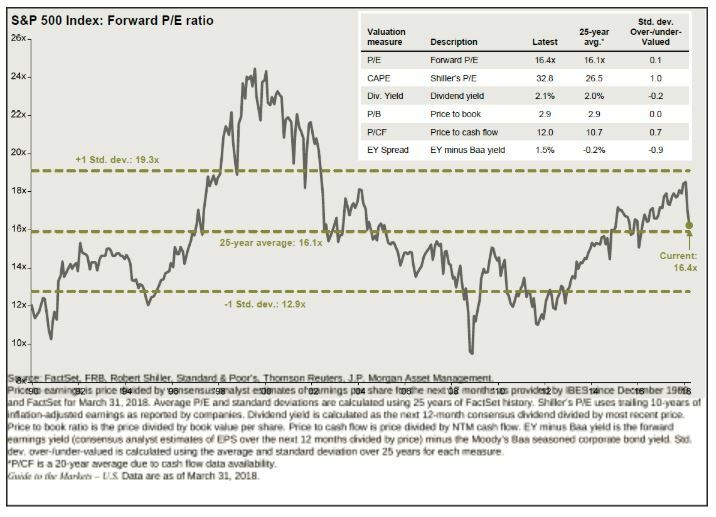 Valuation Levels – With the growth in earnings and the recent pull back in the equity market, valuations measured by the forward looking P/E ratio (Price/Earnings) are now closer to historical norms. The forward P/E ratio for the S&P 500 is 16.4, which is only slightly above the historical average of 16.1 as shown on the chart to the right. Interest Rates – As we discussed earlier in this commentary, we feel we are entering a period of sustained rising interest rates which can be an anchor on stock prices, especially high dividend paying stocks. Rising rates can also have a negative effect on fixed income investments, particularly those which have high durations, or interest rate sensitivity. Sentiment – While not as powerful as the three prior forces discussed, market sentiment is a driver that we need to keep our eye on. 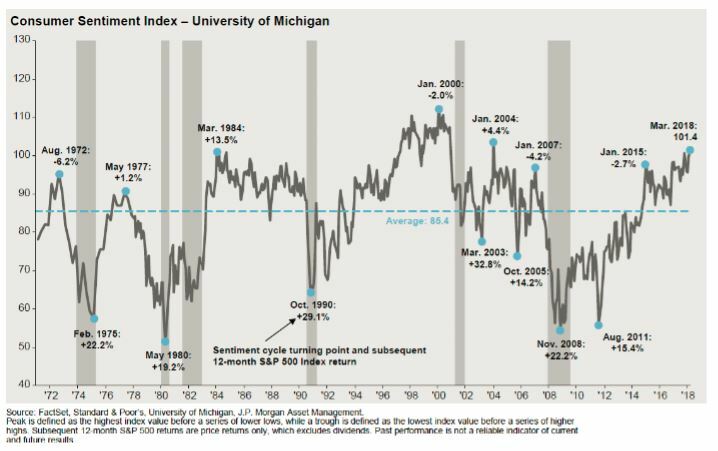 When sentiment and optimism are too high, and more people believe that the stock market will rise perpetually, periods of negative returns tend to follow. Currently the consumer sentiment index is fairly high which a negative at this point for stock prices. As we move into the next market cycle, while considering these fundamental forces, we feel that US equity returns will be lower than they have been historically. We will continue to search for different ways to add value and drive return in your portfolio. Diversification will be key, as we explore international markets, real return assets and alternative fixed income investments further. As always, if you have questions or thoughts about your investment plan, make sure to consult your Wealth Advisor. They will continue to work on your behalf to help you achieve your financial goals. We truly appreciate the opportunity to serve you.